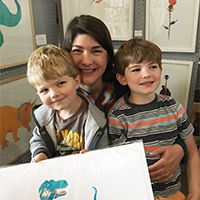 I’m Lesley, the artist behind Peppered Paper, Mama to three little boys, lover of color. I’m happy when my hands are getting messy: in the kitchen, in the home, in the garden, and of course, in the studio, with paint, paper, scissors, and glue. My recent collage work incorporates my peppered paper, large sheets of paper that originally provided a surface to catch all of the spills, splatters, and brush strokes as I painted. The result is a collection of beautiful papers filled with vibrant color and energetic texture. I meticulously curate, cut, arrange, and glue these happy papers to shape my collage works. I love the resulting juxtaposition of sharp clean edges against the chaos of painterly paper. I also find joy in the balance of my creative process; freely and expressively painting my papers which are then very meticulously cut, arranged, and glued. Both steps of my creative process are very intuitive to me and provide the important result of hands messy with paint and glue. I’m inspired by taking bits of “scattered items” and crafting something beautiful with them.